Created on 2018-05-30 11:19 by vstinner, last changed 2019-04-26 07:41 by vstinner. This issue is now closed. test_asyncio.test_start_tls_server_1() got many fixes recently: see bpo-32458 and bpo-33674... but it still fails on Python on x86 Windows7 3.x at revision bb9474f1fb2fc7c7ed9f826b78262d6a12b5f9e8 which contains all these fixes. The test fails even when test_asyncio is re-run alone (not when other tests run in parallel). Maybe something is wrong with my karma, I don't know. Or test_asyncio just hate me. I run them in Windows 7 VM on Mac OS. All other tests pass fine for me except test_sendfile_close_peer_in_the_middle_of_receiving. Andrew, please look at this, this is your test, and I'm not sure I follow why we use SNDBUF at all. IMO it should be possible to write a test without using that (or if not, maybe time to use mocks). With regards to start_tls tests -- I give up, I don't have time to look into this before 3.7.0. I suggest to mask the test on the specific win buildbot it crashes on and fix it before 3.7.1 (or maybe when Windows users come up with a reliable way to reproduce the bug). 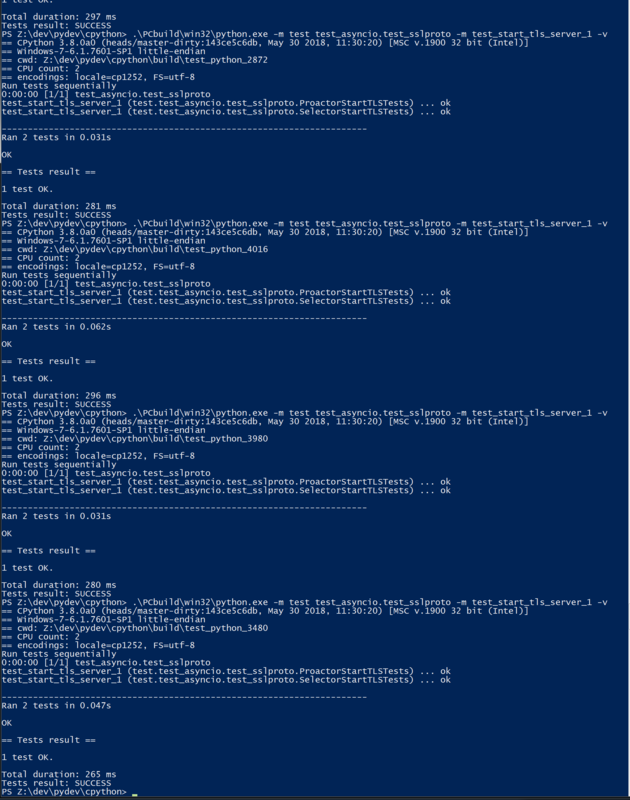 I used SNDBUF to enforce send buffer overloading. It is not required by sendfile tests but I thought that better to have non-mocked way to test such situations. We can remove the socket buffers size manipulation at all without any problem. > We can remove the socket buffers size manipulation at all without any problem. When I tried to do that I think I was having more failures with that test. But really up to you. > I used SNDBUF to enforce send buffer overloading. The test also failed on AMD64 Windows8.1 Refleaks 3.7. This buildbot is also very slow because it runs reference leak hunting. It confirms that the remaining issue is a race condition which is only seen when the system becomes slow. A variant of the bug? It seems like SSLObject.do_handshake() is only attempted once and... then nothing. The client is supposed to send data, retry the handshake, or something, but it does *nothing*. So the handshake never completes and the test hangs to later fail with a timeout. Sorry, the patch to reproduce the issue on Linux is wrong: it introduces a bug in the test. Ignore this comment. # goes through `future.cancel()` and `loop.call_soon()`. # exit *immediately* without doing any cleanup/rescheduling. This method cancelled the pending overlapped WSARecv(), and then create a new overlapped WSARecv(). Even after CancelIoEx(old overlapped), the IOCP loop still gets an event for the completion of the recv. Problem: since the Python future is cancelled, the even is ignored and so 176 bytes are lost. I'm surprised that an overlapped WSARecv() cancelled by CancelIoEx() still returns data when IOCP polls for events. HasOverlappedIoCompleted() returns 0 in that case. The problem is that currently, Overlapped.cancel() also returns None in that case, and later the asyncio IOCP loop ignores the completion event and so drops incoming received data. Yury, Andrew, Ned: I set the priority to release blocker because I'm scared by what I saw. The START TLS has a race condition in its ProactorEventLoop implementation. But the bug doesn't see to be specific to START TLS, but rather to transport.set_transport(), and even more generally to transport.pause_reading() / transport.resume_reading(). The bug is quite severe: we loose data and it's really hard to know why (I spent a few hours to add many many print and try to reproduce on a very tiny reliable unit test). As an asyncio user, I expect that transports are 100% reliable, and I would first look into my look (like looking into start_tls() implementation in my case). If the bug was very specific to start_tls(), I would suggest to "just" "disable" start_tls() on ProactorEventLoop (sorry, Windows!). But since the data loss seems to concern basically any application using ProactorEventLoop, I don't see any simple workaround. Yury, Andrew: Can you please just confirm that it's a regression and that a release blocker is justified? race.py: simple echo client and server sending packets in both directions. Pause/resume reading the client transport every 100 ms to trigger the bug. Using ProactorEventLoop and 2000 packets of 16 KiB, I easily reproduce the bug. So again, it's nothing related to start_tls(), start_tls() was just one way to spot the bug. The bug is in Proactor transport: the cancellation of overlapped WSARecv() sometime drops packets. The bug occurs when CancelIoEx() fails with ERROR_NOT_FOUND which means that the I/O (WSARecv()) completed. One solution would be to not cancel WSARecv() on pause_reading(): wait until the current WSARecv() completes, store data something but don't pass it to protocol.data_received()!, and no schedule a new WSARecv(). Once reading is resumed: call protocol.data_received() and schedule a new WSARecv(). I fixed the root issue, a race condition in ProactorEventLoop. But I prefer to keep the issue open a few days to see if the bug is really gone from all CIs. It seems like Python 3.6 (at least the 3.6 development branch) doesn't have this bug. It didn't see the bug recently, so I close the issue. Python 3.6 has a different issue: pause_reading() cannot be called twice, same issue with resume_reading(). But I'm not sure that it can be called a bug. Python 3.7 allows to call these methods twice and to call these methods while closing: they just do nothing in that case. Since it a minor change we can reconsider it as s bug fix. Feel free to make a pr.